Just in time for Sunday’s season eight premiere, Ommegang and HBO have launched For The Throne, their newest “Game of Thrones”-inspired beer. The fifth release in the collaboration series, For The Throne is a beer-wine hybrid that was partially fermented with pinot grigio and viognier grape juices. So should you reach for a goblet or a horn to fill up with this fine brew? Well, neither because we don’t actually live in Westeros and that would just be silly. 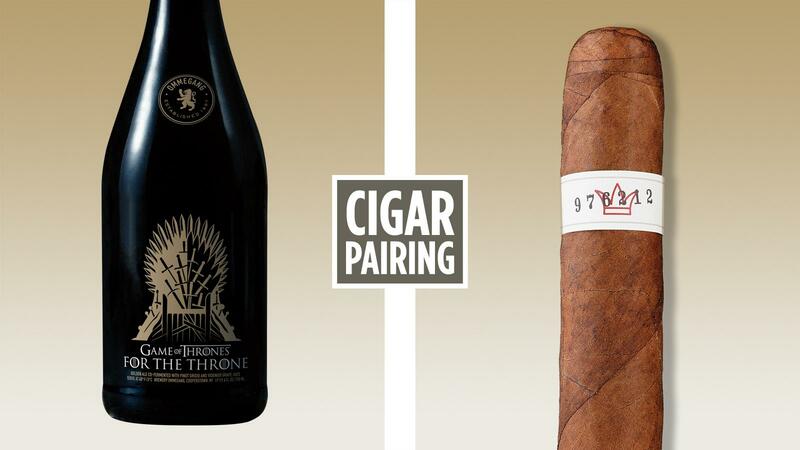 One thing is for certain: You’ll want to grab a great handmade cigar to fire up with For The Throne. According to Doug Campbell, president of New York-based Brewery Ommegang, For The Throne is actually a oenobeer, a style that he says “is a rapidly expanding area of study for us.” Classified officially as Italian Grape Ale by the Beer Judge Certification Program, oenobeers are typically brewed with some amount of sugars from grapes. To still be legally classified as beer, the amount of grapes (or other fermentables) must be less than 50 percent. In the case of For The Throne, the brew went through a primary fermentation using Ommegang’s house yeast and was then co-fermented with pinot grigio and viognier grape juices, meaning the grapes were in the same vessel. The brew was hopped with Bravo and Saaz varietals, while a hint of Champagne yeast was added for bottle conditioning. The result is a golden ale with a fruity profile with just enough sweet malt flavor to stand up to a cigar. Appearance: Pours a copper-gold color, with a little cloudiness. Big, craggy head offers nice lacing that continues until the last sip. Aroma: Toasted grain, with soft dried flowers (honeysuckle) and hints of pears and apples. Palate: Sweet malt at the start of this light and bubbly brew. A stony, vanilla note shows, before honeydew and melon come in, along with apricots. Finish offers faint cherry notes. Cigar Pairing: Warped Serie Gran Reserva 1988 Robusto (94 points) The malted chocolate and earthiness from the cigar clings to the stony vanilla note in the beer to create a marzipan effect. Great pairing.